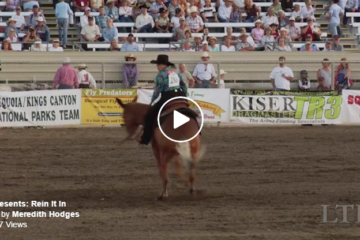 George Morris is schooling riders over a liverpool, teaching them how to educate their horses to a spooky jump. The internet comments seem to be very divided on this subject. It seems a lot of people think his use of the crop in this method is inappropriate. Yes, they just told the horse to stop and now they're using the crop! No, George Morris knows what he's doing and his methods work! What do you think? 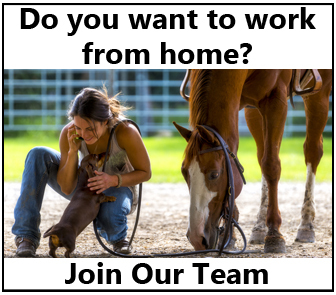 Share this on Facebook if you’d love to ride in a George Morris Clinic! 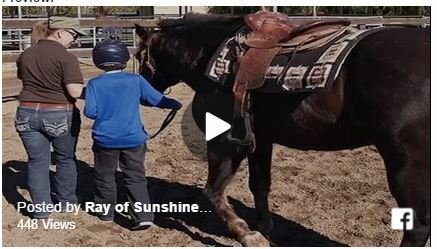 Equine Therapy For Cancer Patients and Family Members – This Is So Inspiring! Basically just threatening the horse that he’s going to get smacked over that jump next time. Not teaching understading of the jump just fear of it. He’s not beating the horse over the fence, he’s actually avoiding doing so by teaching them to stay in front of the leg at all times. They’re thinking “I’m going to spook at the fence because it’s blue and scary” and he’s saying, “no, you’re going to go forward and have no other excuse.” Why give them the option to spook at it in the first place and potentially run out? It’s just a different method of discovery, and a different way of associating aids – like Morris says, they hear a cluck and the crop and think the same reaction. I fully agree. I’ve also ridden in a clinic with him where we also used this method. What you don’t see, is the entire clinic he is setting the riders and horses up for success by using the crop in earlier exercises. By the time you get to the Liverpool they know just a light tap is necessary to mean to go forward, if you notice none of them even hit their horses with the crop, most tap, with a cluck. When he had me do this exercise it was also to a liver pool and I was on a young horse that had never jumped one before. It was like butter. Easy peasy and he wasn’t scared of the liver pools after. It was a nice way to show it to him and get him to understand that he must go forward if I ask. Which he did. 1. Lay tarp on ground, walk horse over tarp till it’s no big deal. I’d even start with walking the horse by hand if it was spooky & feed treats every time it took a step towards & then stepping on the tarp. I’d treat the horse for good attempts & then success. Let the horse put its head down & smell & examine the thing as much as he wants. 2. Fold the tarp in half & do as in #1. 3. Put folded tarp in between standards & then do as in #1. 4. Put 1′ rail over tarp in standards & jump over it at a trot – NO STOPPING. The horse shouldn’t stop & spook if you’ve thoroughly done 1-3. 5. Put the liverpool set-up btwn standards w/1′ rail & trot over it. With lots of treats in repetition, the horse should look forward to jumping that thing. But what would you do in a warmup/schooling show situation where you don’t have time to desensitize? While I’ve never used the crop+cluck method at a standstill, I have let a horse look, get close, and I cluck to allow them to associate forward. Obviously in an ideal world, all horses would be properly desensitized to all sorts of jumps before showing, but part of showing is being able to make decisions on the fly and using available aids and tools appropriately and judiciously in situations as they arise. Agreed!! Thank you for posting this!! Makes much more sense to me!! Will you stop in the middle of your round and feed him a treat? Having ridden with and audited clinics with George Morris I can honestly say that his methods are 100% accurate and effective. What you are not seeing is the whole beginning of the clinic explaining how this all works. 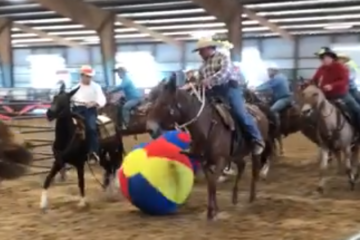 Leave the parelli at home and focus on what a master who has ridden longer than most people have been alive and coached some of the best and most winning riders in the world, tells you to do. Wow, testy, testy! Then, would you place in the ribbons after stopping in the middle of a round & having to give your horse the crop in order to get over a jump? This is all about training, not what you’d do while competing – SHEESH! I doubt that anyone on here would be showing their horse after never having exposed him to, & successfully jumping, most of the challenges they would meet on a course, hundreds of times. There is much scientific evidence that the horses (or dogs) can not make the correlation that many treats for walking over the tarp will make them want to go over the jump because they get treats after the jump. I do not think horses can reason that using a treat for doing something is a reward. It is more like at first using the treat distracts them and grounds them because eating a treat feels good to them. THus, eating the treat while walking over the tarp feels better to them than no treat and just concentrating on the tarp and not feeling good about it so not walking over it. 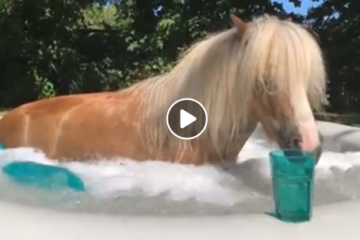 Some proof of this is that some horses are not going to walk over that tarp even if you give them their highest value treats because eating that treat does not make them feel good enough/grounded enough to walk over the tarp. Thus you have to try a different way. If you like your way then use it. But it is always good to have the George Morris way in your bag of tricks so if you get a horse where your way does not work, then plan B can be to give his way a try. You guys dont know anything about horse training. George can see in a horse what other people will never be able to see. He is a legend in his own time. Coaching the brazilian team for RIO. That should tell you something. I trained with him he is a true master of training horses and people. I have to say that a simple rolled up blue tarpaulin just like a blue jump pole introduced to the horse as a trot pole and then widened off in increments according to the confidence of each horse as it gains in confidence is a far more positive and easier method. Using this approach the horse will always be confident and happy to jump the water tray and no force is required. I meant no disrespect to Morris in my comment. What I know about jumping could fit in a thimble compared to his experience. But, what I outlined was a way to desensitize a horse with little to no danger to the rider, or the horse, who is riding by themselves. I have worked with dozens of professionals and have certainly found that there is more than one way to approach a challenge, and in many circumstances, there are many choices and either may work the best. You just have to pick what will work best for you & your horse. But, I do know that letting a horse choose to do something that might spook it, is far better than any kind of force. If a horse learns that anytime it’s unsure about something & it’s going to be rewarded for facing it & dealing with it, rather than being forced, it then becomes less afraid to meet strange things.